Very few railings are really necessary. Roads can be safer when railings are removed. This is because people prefer to walk in direct lines and may get trapped between them and traffic in the road. 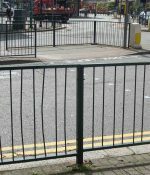 Junction assessments by Transport for London have found that most railings in the capital can be removed without compromising safety. The immediate advantage is that the street has a less cluttered feel. Down load the information sheet on railings and on comfortable crossings.